Often times a band will make it big and have incredible radio and chart success with a few hit songs only to lose sight of who they are and what made them so popular with their fans. After its 2006 derailment with the commercially unsuccessful CD For Me, It’s You and subsequent three year hiatus, record execs were saying it was over for this Grammy Award winning band called Train. Surprisingly, singer Pat Monahan, guitarist Jimmy Stafford and drummer Scott Underwood proved them wrong in 2009 with the comeback mega-hit “Hey Soul Sister” from their Save Me, San Francisco CD. 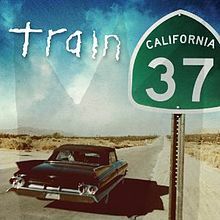 So, has Train’s latest offering and sixth studio album, California 37, kept on track and stayed true to the formula of catchy riffs and melodies, supported by Monahan’s imaginative lyricism? I took a ride with Train and found out. What I experienced on this road is an album that is filled with personal songs about romance and second chances, with reflection on mortality and the afterlife. But, to keep it fun, Pat throws in plenty of references to pop icons and culture that we all recognize. The opening track “This’ll Be My Year” is reminiscent of Billy Joel’s “We Didn’t Start The Fire” in that it references pop culture and events, here, spanning from 1985 to present time. The difference is that this list of events is intertwined with personal events within Monahan’s life that, although good and bad, are leading up to the culmination of his life—his relationship with his current wife Amber. The rocking chorus is a memorable highlight. “Drive By”, the first single, has met chart success with its pounding cadence and smooth-flowing, somewhat spoken verses and catchy chorus. Two slower love songs on the album that happen to be without percussion, “Feels Good at First” and “Sing Together” gain their charm from flute in the chorus on one, and a return of the ukulele in the other. Speaking of charm, one of my favorites is the country-tinged duet “Bruises”, featuring country singer Ashley Monroe, which tells a convincing story of old friends catching up and finding comfort in each other’s respective wounds since high school. Going in a totally different direction, “50 Ways to Say Goodbye” is a mariachi type song that adds some interesting variety to this collection of songs. It’s a tale about a jilted lover who is in reality explaining 50 ways to lie about the death of the girl who has just broken up with him, rather than explain the truth to his friends. The lies are amusing…watch out for that “crappy purple Scion”. If you can get past the whistling intro to “You Can Finally Meet My Mom” keep listening and you’ll discover a thoughtful song that lists a wide array of pop personalities who have passed on. Although paying homage to them, Pat would ultimately rather spend all eternity hanging out with the love of his life, Amber, where he intends, as the title suggests, to introduce her to his mother. Personally, I would at least say “hi” to the “dude who had pop rocks and soda at the same time”. I’ve heard multiple comparisons to the style of Enrique Iglesias in “Mermaid”, and I’d have to agree. But this is once again, a well-crafted song that paints a picture with words while it likens finding his current love to meeting said fabled creature on a deserted island. The title track, “California 37” is a swaying short track filled with attitude that not only slams Pat’s ex-wife and a past collaborator, but addresses their critics in an admirable Tim Tebow style. Monahan assures us that the band is in a better place now, and found their way back to their roots. As this ride draws to an end the two final tracks are masterfully composed lyrically and musically, as if intended to evoke emotions that gave me goose bumps. Not only are the lyrics deep, but the build-up in both songs brings you to a climax and then sets you down again. I especially like Jimmy’s guitar in “We Were Made for This” and the use of horns in “When the Fog Rolls In”. What I got from listening to this CD was way more than I expected. I was pleased to once again be treated to the masterful lyricism of wordsmith Pat Monahan, who has a way of writing that makes the lyrics a highlight. You really want to listen and “see” what he’s saying, albeit quirky at times, his words are entertaining if not moving. The artful use of putting the right words together can add a rhythm and rhyme to a song that is just as pleasing to the ear as the great musical composition of instruments and sounds. Pat Monahan is a master of that. The other members of the band did a great job taking care of the music. The surprise was the variety of styles here that kept me interested throughout, and I never forgot it was Train. I highly recommend purchasing the whole album from iTunes so you can get the bonus track, “To Be Loved”, which is another great pop/rock song in true Train spirit. The boys are right on track. Keep rolling, Train…full speed ahead.